Floating staircase is a perfect solution for all those who strive for excellence. Small wonder, it is one of the most popular staircase designs nowadays. The steps are attached to a wall or a hidden stringer on one side, whereas the steps on the other side are unsupported, which gives the impression of floating in the air. Very often there is no balustrade installed. 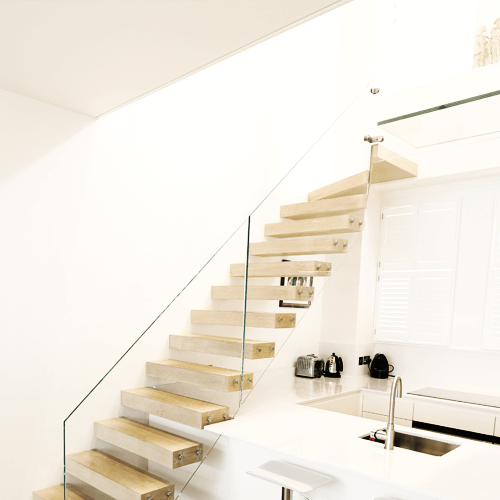 Alternatively, a frameless transparent glass banister can be fitted not to spoil the feeling of openness. Style is the key to success! At Exclusive Staircases we can design and develop a bespoke staircases that look amazing features in any size room. Thanks to our expert team your choices are endless. Treads can be made in glass, steel or wood, but other materials are possible as well. At Exclusive Stairs, we have a wide selection of floating staircases, and you can decide on a straight, curved or quarter turn structure. Contact us today and give your home or office a look of distinction one can only find in interior design catalogues.